A typewriter with keys blackened by years of frustrated fingers occupies a prominent counter at what can be Boston’s most maddening bureaucracy, the Inspectional Services Department. The IBM Wheelwriter 1500 is not an artifact in a historical display to show how business was once conducted. No, the typewriter is required to file an appeal with the Zoning Board of Appeals. This week, the typewriter is expected to meet its replacement — a new computer kiosk, as Mayor Martin J. Walsh’s administration tries to drag Inspectional Services out of the technological dark ages. The initiative is part of a broader effort to remake the agency known as ISD, a place most constituents relish about as much as the dentist or the Registry of Motor Vehicles. But Inspectional Services may matter now more than ever as Boston flourishes with the biggest building boom in a generation. Prolonged waits for building permits and zoning reviews can stall momentum. Inspectors ensure that the development frenzy does not compromise safety. Applications for building permits have surged 20 percent. Walsh administration officials contend that they have reduced the processing time, although they acknowledge more improvements are needed. Contractor Mark Waldron said he tells homeowners to expect a six-week wait for a permit, but recently he has received approvals in three weeks. 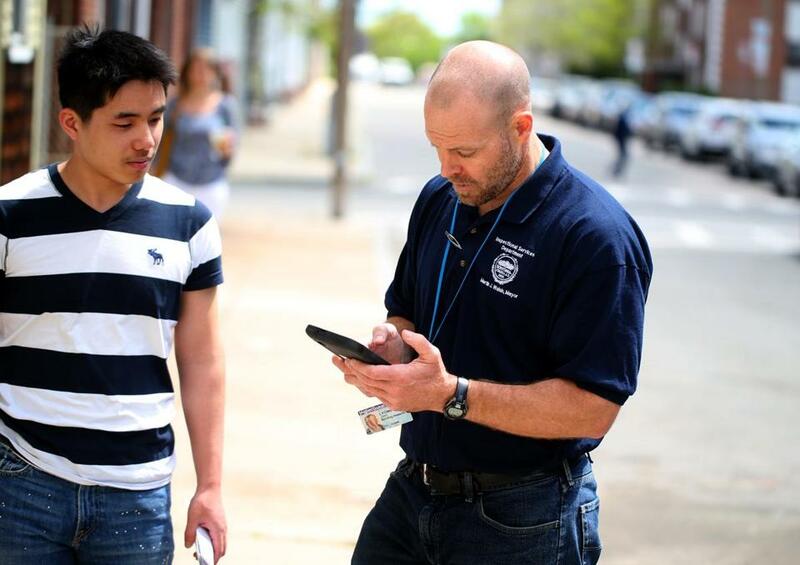 Building inspector John Lyons uses a paperwork-cutting tablet on rounds in South Boston. Inspectional Services, which has about 250 employees and a $16.5 million budget, is housed in a building that sits roughly 3 miles from City Hall. The location outside downtown is convenient for contractors, but it has isolated ISD from supporting agencies, most notably the city’s IT department. Before becoming commissioner, Christopher spent three decades as an architect and knew firsthand the strengths and perils of ISD. (His workaround for the IBM Wheelwriter involved scissors, glue, and a color copier). Since last year, the department enabled cellphones for inspectors who had been communicating with what were essentially walkie-talkies. An online permit tracker helps identify bottlenecks in the bureaucratic morass. At the Zoning Board of Appeals, the city began holding informal proceedings on Thursday nights for small businesses and owners. In the past, mom-and-pop applications faced the same Tuesday morning hearing as large developers and major institutions. This week, the city is also launching a pilot program to digitize building plans so documents can be viewed electronically. Under the current system, rolled-up architectural renderings are stuffed in green canvas bags and driven from ISD to other city agencies and back. “This is one of the systems we are so happy to get rid of,” Christopher said, noting that his plans had been lost in the past. Contractor Wei Huang watched as inspector John Lyons worked on his tablet, which replaced a bulky laptop. 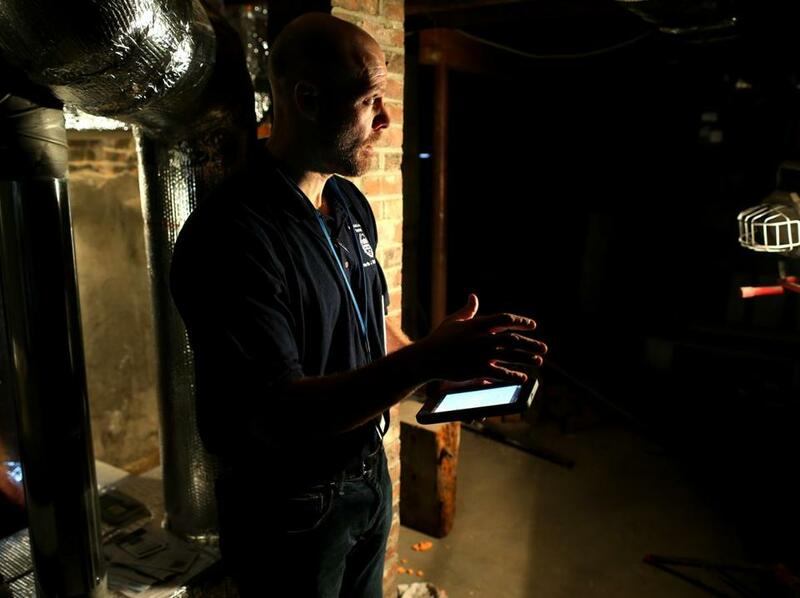 Last month in a gutted home in South Boston, city building inspector John Lyons tapped on the screen of a hand-held Samsung Galaxy tablet. The city deployed two dozen of the 14-ounce devices in April to help free inspectors of time-consuming paperwork at the end of each shift. Inspectors had been lugging around brick-like laptops from 2009 that weighed more than 5 pounds and did not function outside. The new tablets cost roughly $5,500 and there have been other expenses, but the major costs have been staff time. Other changes are designed to soften the edges of an agency with a gruff reputation. The office now includes splashes of color on what were once monochromatic walls. Large-screen televisions with news, weather, and other information give constituents something to watch as they wait in line. The department hopes to implement a system similar to the Registry of Motor Vehicles, with patrons pulling a number and waiting to be called to a counter. The most significant change, officials said, has been the work with technology gurus from City Hall. The permitting project manager, Alex Lawrence, has become the ISD whisperer, helping skeptical employees embrace technology.